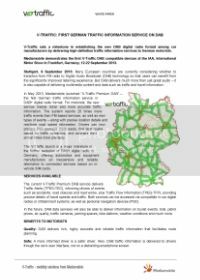 In May 2013, Mediamobile launched "V-Traffic Premium DAB" – the first German traffic information service in DAB+ digital radio format. For motorists, the new service means richer and more accurate traffic information. The system reports 20 times more traffic events than FM-based services, as well as new types of events – along with precise location details and real-time road speed information. Drivers can now prepare their journeys more easily, find best routes based on traffic conditions, and estimate their arrival times more precisely. The V-Traffic launch is a major milestone in the further evolution of DAB+ digital radio in Germany, offering automotive and equipment manufacturers an inexpensive and reliable alternative to connected services based on in-vehicle SIM cards.